Watch the video of the livestream here now! In the 80s we didn't have the internet, you had to really work to find good music. And it was especially difficult to find "mod" bands. You knew the locals of course, but out there in the hinterlands who knew what the hell was going on. 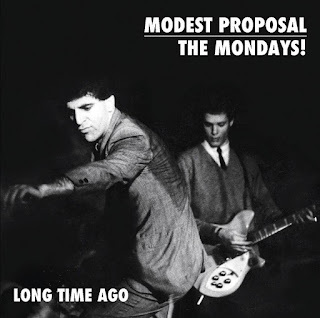 Well, somehow I found out about Washington DC's Modest Proposal early on with the release of their 1985 single I've Seen Your Face Before b/w Nobody Says No and I was hooked. The album that came a couple years later was just as good, delivering a dozen sixties influenced, power pop tracks that have stood the test of time pretty well. The internet makes the world a smaller place, as it did in 2009 when Modest Proposal's lead singer Neal Augenstein contacted me to let me know they were have a reunion show. Now they're beyond just reuniting and the band is putting out a new release, part Modest Proposal, and part their later band The Mondays. So, to celebrate we're hosting a livestream on Sunday, July 22 at 8pm EDT / 5pm PDT on the modacast Facebook page. Original members Neal and Bill Crandall will be on hand to play some songs and answer questions. The new album comes out August 10th, on Detour Records. Only printing 200 CDs, so you're gonna want to get in on the presale for this one!